JS Bach's Die Kunst der Fuge - The Art of (the) Fugue BWV 1080 remains something of a mystery regarding its purpose, was it really written for performance and by what instruments? And the work is equally tantalising because the final contrapunctus is incomplete. The German Japanese pianist Kimiko Ishizaka has been slowly exploring the keyboard music of Bach. 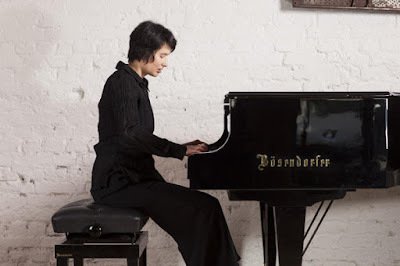 She recorded the Goldberg Variations in 2012 as part of her OpenGoldberg project, and recorded the first volume of Bach's The Well-Tempered Clavier for Navona Records in 2015. Now she has reached The Art of Fugue and in typically thorough fashion has produced her own completion of the work. Kimiko Ishizaka performed this new edition of Bach's The Art of Fugue for the first time on Saturday 19 March 2016 in the Hall (Aula) of St Aposteln Kirche in Cologne. The concert was part of Bach in the Subways. Kimiko Ishizaka played from memory,and without a break in a performance lasting 90 minutes. In person she has quite an unassuming stage persona and at the end she seemed surprised at the warm response. But her performances are anything but unassuming, she plays without using the sustaining pedal combining a firm detaché touch with a range of legato and semi-legato . That she is a former Olympic weightlifter and powerlifter comes as no surprise when you witness such a slight form, apparently relaxed and involved in the music, producing such powerful and strongly vivid sounds. Kimiko Ishizaka's style is perhaps a halfway house between Romantic and HIP, she keeps the clarity of line and detached feel of HIP Bach at the piano but shapes it in an expressive manner with a dynamic range clearly romantic, and each of the fugues was individually characterised. Bach's The Art of Fugue, written in the 1740s, has no clear performance tradition coming from the composer's lifetime. The manuscript and first printed edition (from 1751, the year after Bach's death) are written on multiple staves suggesting instrumental performance, but this was also an older style of writing keyboard music. There have been suggestions that the individual lines do not correspond to ranges of instruments in Bach's day, but others counter with the fact that some of the movements do not lend themselves easily to keyboard performance. The work may not be unfinished, some modern scholars suggest the final pages may be lost. Any performer has to digest much of this and then forget it, and recreate the work in their own image during performance. We started with a quiet intensity which built to quite powerfully expressive climax, and throughout the whole piece there was a sense of continuous movement and progression, rather than static beauty. Kimiko Ishizaka seemed concerned with the linear layers of Bach's structure rather than stopping to admire the scenery. The second contrapunctus was notable for its rhythmic excitement whilst in the third the variety of different tones Kimiko Ishizaka used brought out the different emotional qualities of the lines. So in the fourth contrapunctus we noticed the way the legato motifs weaved in an out of the more detaché textures. By the fifth contrapunctus we would appreciate the different characters of the movements from the opening notes. Number six had a rather galant style with a more stylised rhythmic grandeur. Seven was graceful, wearing its complexity and learning lightly whilst eight had its harmonic and rhythmic complexity enlivened by a vigorous touch. Kimiko Ishizaka's playing, even when lively, was rarely skittish. In the busy ninth contrapunctus the wonderful evenness of her semi-quavers impressed. Contrapunctus ten was perhaps almost perky, but though the subject emerged rather slyly it developed serious intensity. Kimiko Ishizaka's articulation in contrapunctus 11 made it rather stylised, but it moved into other territory, complex in structure and intensity. Contrapunctus 12 was given with a sense of articulation which made us expect a lively movement but which Kimiko Ishizaka gave an intensely serious character whilst contrapunctus 13 was almost romantic in the level of emotional characterisation. 14 had a real strength to the spring in the underlying rhythms and this carried over to contrapunctus 15. No. 16 was intensely chromatic with wide spacing between the lines, and here we started to apprehend the real abstract nature of Bach's writing. Number 17 returned to the rather perky yet serious and intent feeling, leading to the intense and spare movement 18, again with a sense of profoundly abstract thought. Number 19 was remarkably engaging, flowing beautifully. The final movement started sober and rather intent, yet enlivened by the rhythmic character of the different motifs. The movement was richly complex and the changes of texture were such that you wondered 'is this the moment when Kimiko Ishizaka takes over?' I have to confess that, without a score, my knowledge of the final fugue is not secure enough to say for certain. And in the later movements Bach takes us to such remarkable places that there was never a moment when I felt that his was wrong. Ending almost mid-air Kimiko Ishizaka's performance was a remarkable tour de force, crowned by a completion of the final fugue which felt perfectly right for this performer at this time. 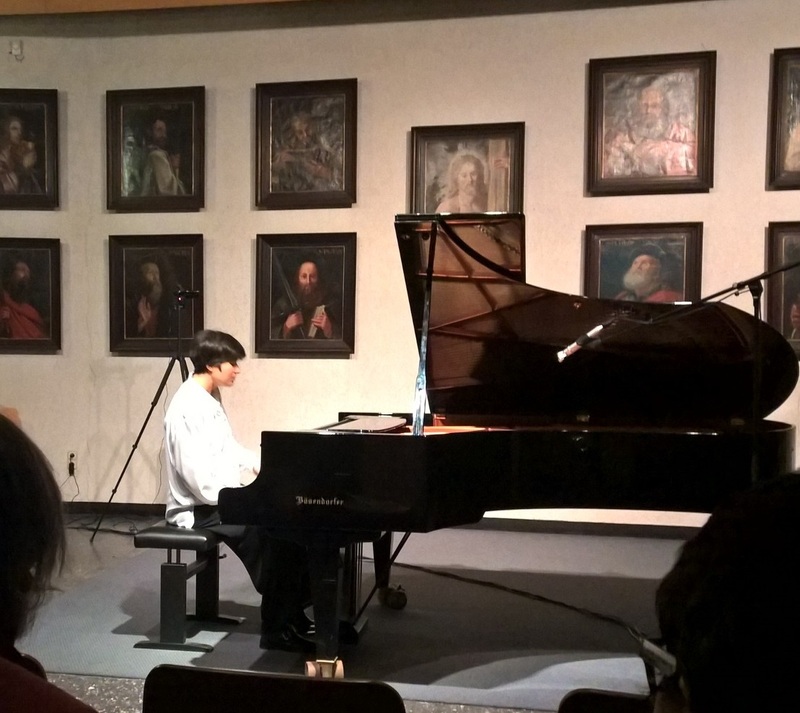 We were treated to an encore, repeating the first contrapunctus though I had wished to hear that final fugue again. My interview with Kimiko Ishizaka will be published on this blog on Saturday 26 March 2016.